1# open visual Basic Editor, then insert a module name as :myInputBoxDemo1. 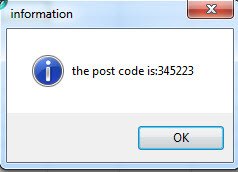 MsgBox "the post code is:" & postcode, vbInformation, " information"
3# back to workbook, then run above macro. VBA.IsNumeric(postcode) function will check if the value of postcode is numeric.